On July 24, 2009, during his vacation in northern Italy, Pope Benedict XVI delivered a homily in the Cathedral of Aosta before Vespers. He commented on a passage of a Epistle of St. Paul (Rom 8:1-2). At the end of his commentary, he praised the French Jesuit Pierre Teilhard de Chardin as a model for priests, attributing to him the idea of a cosmic liturgy, which he said was something they should aim to achieve. Teilhard is quoted by the Pope in his homily as if his doctrine were a spring of pure waters that the faithful could approach and drink without any vigilance. 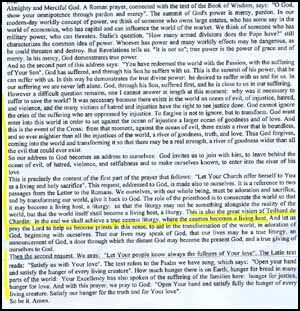 The opposite instead is true, since the theological work of the controversial Jesuit - such as his teaching on evolution - was condemned by the Holy See in the past. 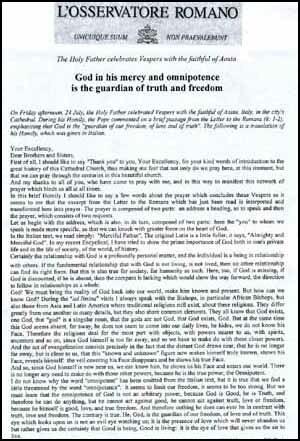 At right, a picture of the L'Osservatore Romano English edition online (July 29, 2009), where the full text of the homily is reproduced. For the original text, click here and scroll to the second title. Below left, we transcribe the last paragraphs for the convenience of our readers. So our address to God becomes an address to ourselves: God invites us to join with him, to leave behind the ocean of evil, hatred, violence and selfishness and to make ourselves known, to enter into the river of his love. This is precisely the content of the first part of the prayer that follows: "Let Your Church offer herself to You as a living and holy sacrifice." This request, addressed to God, is made also to ourselves. It is a reference to two passages from the Letter to the Romans. We ourselves, with our whole being, must be adoration and sacrifice and, by transforming our world, give it back to God. The role of the priesthood is to consecrate the world so that it may become a living host, a liturgy: so that the liturgy may not be something alongside the reality of the world, but that the world itself shall become a living host, a liturgy. This is also the great vision of Teilhard de Chardin: in the end we shall achieve a true cosmic liturgy, where the cosmos becomes a living host. And let us pray the Lord to help us become priests in this sense, to aid in the transformation of the world, in adoration of God, beginning with ourselves. That our lives may speak of God, that our lives may be a true liturgy, an announcement of God, a door through which the distant God may become the present God, and a true giving of ourselves to God.